.scot domains are here - register now! 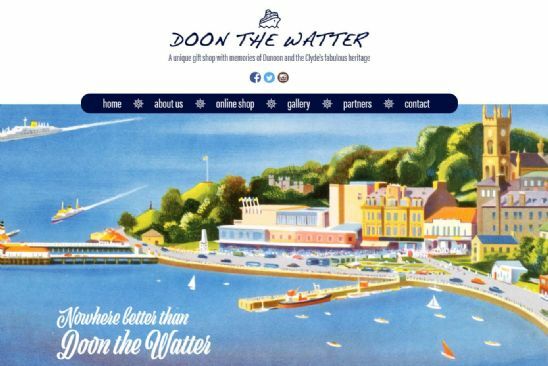 Doon the Watter is a gift shop based in Dunoon, in Argyll that specialises in local maritime gifts and art. With products featuring Dunoons history, and the heritage of the Clyde, the site allows you to peruse the stock and encourages you to visit the shop and the area itself. Many of the gifts are themed around steamships such as the PS Waverly, and you can also view a gallery of some of those steamers. Gifts include mugs, posters, watches and books with the shop partnering with local suppliers to help the local economy. With geography being a key factor relating to this business, as the products are locally produced and sourced, plus the subject matter is of local interest, then a .scot domain name makes sense to promote the business. Visit the website to find out more. Register your .scot domain name with Calico now.